After suffering a stroke, from the acute post-lesional phase, a reorganization of neural networks that have not been affected is generated, so that the healthy neurons can “learn” functions from the damaged neurons and then replace them, leading to neuronal plasticity or neuroplasticity. Neuroplasticity or neural plasticity is the ability to auto-reorganise nerve tissue. This phenomenon (neuroplasticity) is determined by genetic factors, patient age, degree of dependency prior to the damaging event, earliness with which neurorehabilitation, social and family support, intercurrent complications, as well as the location, intensity, nature and extent of the brain injury begin. Most symptoms after stroke are not only due to the injury itself, but due to the hyperactivity registered in the hemisphere intact to the injured hemisphere, which is inhibited. On the other hand, TMS (Transcranial Magnetic Stimulation) accelerates neuroplasticity mechanisms, quickly reorganizing brain connections, which leads to greater efficiency of neural networks in the affected area. Low frequency (≤ 1 Hz) repetitive TMS (rTMS) applied to the healthy hemisphere reduces diffuse cortical activation, after a stroke, in the primary and secondary motor areas of both brain hemispheres, activating the injured cortical area that had been inhibited and encouraging its excitability and motor recovery. However, low frequency rTMS (≥ 5 Hz) increases cortical excitability and can be applied to produce a neural stimulation of the cortex of the injured hemisphere. Meaning it accelerates neuroplasticity mechanisms, quickly reorganizing brain connections, which leads to greater efficiency of neural networks in the affected area. 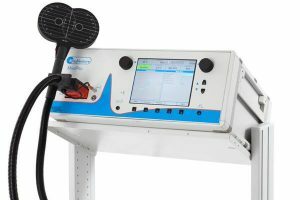 TMS has come to be considered a therapeutic reality for neurodegenerative, psychiatric, neurological diseases and other clinical specialties conferring neuroprotective effects that impact positively on the modulation of neuroplasticity, helping the brain in its ability to renew and/or reconnect neural circuits and thus acquire new skills. TMS in stroke can also be used as a regenerative therapy technique. With regard to its therapeutic effects in stroke patients, TMS can be focused towards enhancing neuroplasticity, and thus towards each of the symptoms associated with stroke (motor recovery, language and swallowing disorders, depression and perceptual and cognitive impairments). The basis of this neurorehabilitation therapy is based on the fact that the brain is a dynamic entity adaptable to both internal and external environmental changes. TMS is a technique that allows us to act positively on these neural changes in a safe and non-invasive, provided that it is implemented by an experienced team: The intensity of the electromagnetic pulse in the implementation of the TMS is an individual and specific measure for each patient, therefore guidelines and protocols have to be followed, given that there is variability depending on the medical and therapeutic equipment used to apply it. 2. – WHAT IS APHASIA? Aphasia is a disorder that affects the ability to express and/or understand language, usually following an injury in the perisylvian region of the left cerebral hemisphere. In short, aphasia is an impairment acquired in the ability to emit and/or understand language, both oral and written, as well as gestural. Language is the vehicle of thought. Aphasia disorders almost always involve other functions of the written language (dysgraphia) and reading (alexia). The aphasic patients clinic will act according to the location and size of the brain injury, as well as the cerebral capacity of healthy neurons to assume the functions of the injured ones (what we call neural plasticity or neuroplasticity). 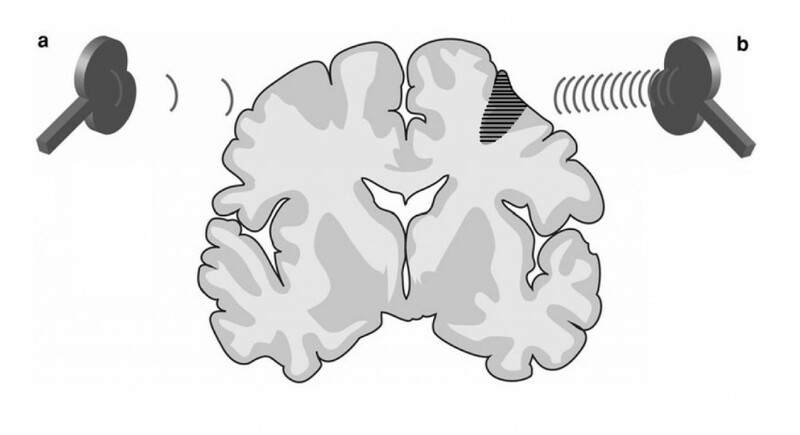 Sometimes, after the harmful event, the organizational changes in the interneuronal brain activity of the affected area and the surrounding healthy regions can recover language capacity. 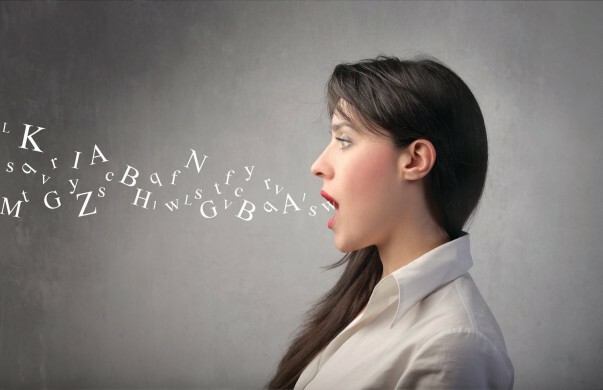 Therefore when patients suffering from aphasia go beyond the acute period of convalescence and are stabilized, they should receive speech therapy in order to help achieve this objective. The cause of aphasia is varied: a stroke or cerebral infarction (this is the most common cause), a head injury, an infection of the brain, a brain tumour, dementia, etc. The right and left brain hemispheres have different functions with regard to language, the left is more specialized in the lexical and syntactic aspects, and right in the prosodic aspects or “emotional” aspects of language. 3- WHAT IS TRANSCRANIAL MAGNETIC STIMULATION (TMS)? TMS is a non-invasive form of stimulation of the cerebral cortex, and represents a technical tool that extends the range of possibilities for study and research in the field of neuroscience, as well as in the treatment of various diseases and neuropsychiatric disorders. It allows safe, painless and non-invasive stimulation of the nervous tissue (cerebral cortex, spinal cord, central motor pathways and peripheral nerves) as well as the controlled regulation of brain activity. TMS is based on the principle of electromagnetic induction discovered by Michael Faraday in 1831. An electric current passes through a coil of copper wire encapsulated in a plastic housing, located on the patient’s head. When a pulse of current passes through the stimulation coil, a magnetic field is generated which passes through the scalp and cranial vault undiminished. 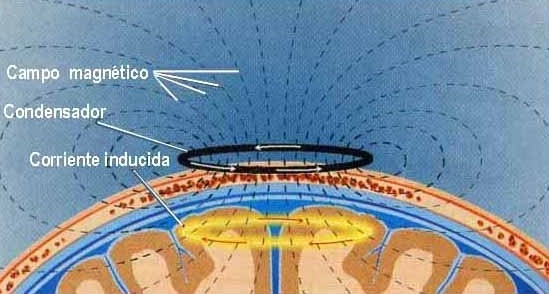 This magnetic field which is variable over time induces an electric current in the neuronal tissue of the brain, whose volume depends on the shape, size, type and orientation of the coil, the strength (intensity) of the magnetic field and the frequency and duration of the magnetic pulses produced. Thus, TMS might be considered a form of non-invasive electrodeless electrical stimulation by electromagnetic induction. 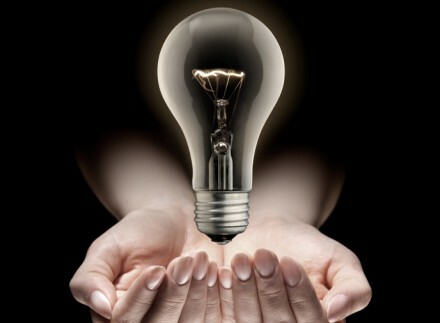 This electric current acts on brain cells (neurons) inhibiting or stimulating their effects. 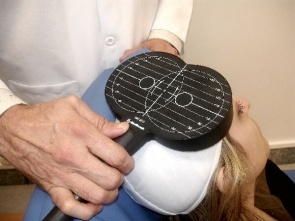 From the therapeutic perspective, there are a lot of studies that show that transcranial magnetic stimulation is effective and can also be considered safe, provided that it is used by a qualified medical team and safety guidelines are met. Since TMS is a non-invasive, well tolerated technique, with few contraindications, it has become a cutting edge therapy, used to treat various disorders, both psychiatric and neurological (especially in patients with cerebrovascular pathology), and is approved by the Food and Drug Administration of the United States as a treatment of choice when the patient experiences a major depression refractory with conventional drug treatment. 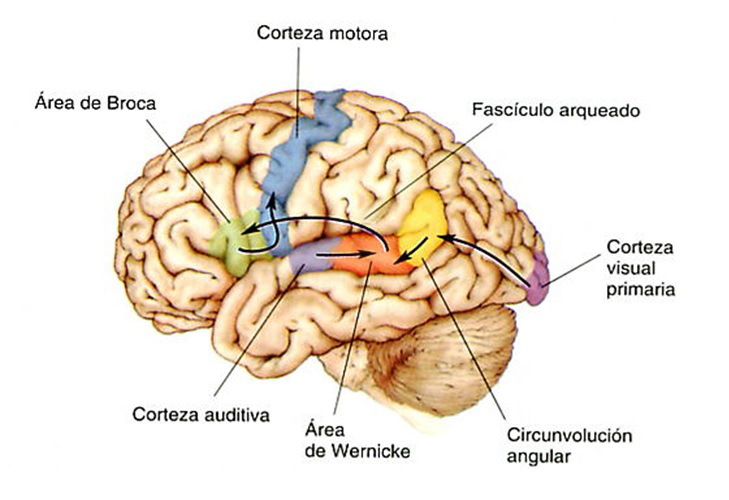 Aphasia: Aphasia, in its various forms, is a common consequence of stroke, especially in the left hemisphere, characterized by impairments in speech, comprehension, reading and writing. Treatment with TMS is more efficient, based on published scientific literature, in patients with motor aphasia (not fluent) or in global forms of aphasia with motor predominance. Several studies have helped to confirm that stimulation alone improves language disorders in the identification of images, such as in spontaneous speech, and repeatition, nomination and comprehension tests. Oropharyngeal dysphagia: Although its incidence is 50% in stroke patients, oropharyngeal dysphagia is underestimated and underdiagnosed, constituting a cause of malnutrition and aspiration pneumonia, which increases the mortality rate in these patients (20-30% of post-stroke deaths). Oropharyngeal dysphagia produces two types of complications: impairments in swallowing efficiency (causing malnutrition or dehydration) and insecurity swallowing (which can produce aspiration pneumonia). Dysphagia after a stroke is a result of the damage to the dominant motor cortex. Before starting the first rTMS session, a medical visit is carried out to verify that the patient presents no contraindication and the patient is able to participate in the treatment. A speech therapy assessment is also performed before and after treatment, and subsequent follow-up visits are made to assess the response to this type of combined neurorehabilitation therapy. APHASIA TREATMENT PLAN: The treatment protocol for aphasia that takes place at the San Vicente Clinic is based on the protocol developed by the Berenson-Allen Center for Noninvasive Brain Stimulation (CNBS) at Beth Israel Deaconess Medical Center and Harvard Medical School, whose scientific support is based on research work carried out mainly by Margaret Naeser and her colleagues. It consists of 10 sessions of rTMS (a daily session for 10 working days of two weeks) of 20 continual minutes of intensive speech therapy (approximately 2 hours daily). DYSPHAGIA TREATMENT PLAN: The application of the stimulation is applied 10 minutes a day for 2 weeks, on the contralesional motor cortex, having demonstrated the improvement in swallowing and decreased risk of aspiration after treatment. TMS is a safe technique provided that safety guidelines are followed. Some patients undergoing this cortical stimulation may experience side effects after application, which might be considered mild and transient, such as cephalic or cervical pain; and in the rare situation of persistence, this is mitigated by taking common painkillers. Moreover, the risk of seizures during TMS is very low and it has not been shown that TMS increases the risk of seizures in patients with controlled epilepsy, once the stimulation session has ended. The main relative contraindications that TMS has are: women who are pregnant and children under six. The following is a list of patients that have absolute contraindications: those with pacemakers, deep brain stimulation electrodes, personal electronic devices (drug infusion pumps) or intracranial metallic elements (metal plates, wires, screws, heart valves or ventriculoperitoneal bypass, cochlear implants, etc.). 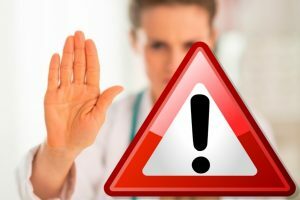 Nor should treatment be performed on patients with uncontrolled epilepsy. Before starting treatment a doctor will evaluate each case individually, to rule out any contraindications. TMS has proven to be a cutting-edge technical ally, safe and effective in treating the deficits that may arise after a stroke, as well as in terms of safety, it is innocuous to the patient. Likewise, TMS has proven to be especially valuable in helping to promote brain regeneration by means of the neuroplasticity mechanism. Excitatory and inhibitory electromagnetic pulses applied in the ipsilateral or contralateral cerebral hemisphere to the lesion, as well as the transcallosal area in order to modulate communication between the two brain hemispheres (depending on the desired effect), offer us the possibility of optimizing functional brain activity by inducing changes in interhemispheric connectivity, as well as achieving recovery of the damaged brain area in less time. The various studies conducted in the field of TMS have confirmed the improvement of motor disorders, aphasia, spasticity, oropharyngeal dysphagia and perceptual and cognitive difficulties that occur in patients with a stroke.